Get Rid of Fleas—Without Terrible Toxins! | Gardens Alive! Question. Our yard is a highway for stray cats; whenever we let our dogs out, they come back in the house with fleas. 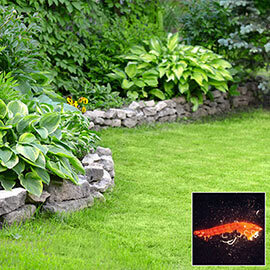 What can we do to get rid of fleas in our yard? Thanks! Mike: My daughter's family just moved into a new house they built in Oklahoma, and fleas have turned up. They need organic ways to rid the house of these pests that will not be harmful to her children. Thanks for any help you can give. Mike: Our cat recently brought fleas in with him and we are now infested with the little buggers. Is there any way we can execute them safely? Please help! Answer. Well, I assure you that I know what to do here, because I recently had to evict these unwelcome visitors from my own home! So did our musical director, Kenn Kweder. And a weakened kitty may have been the cause in both cases. The McGrath home is Stray Cat Central; our current brood includes one rescued as an almost-dead kitten from a farm (Tigger, aka "Fat Boy"), one that was dropped on our vet's doorstep at the age of one day and raised by us since Day Two (that's Squeeky, "the bad girl"), and a once-feral cat rescued during a Virginia vacation with the help of Alley Cat Allies, specialists in wild cat rescue and rehab (www.alleycat.org). That's "the baby", whose proper name is Houdini, but who we always call Dini; she vanished this summer and then reappeared after two weeks, hungry, frazzled and talking up a storm. A few days later, my son Max is asking what all these little black bugs were on his ankles. The exact same thing happened to Kenny a week or so later. His rescued stray disappears, reappears a week later, ill and all shaken up, and before you know it, Kenny's ankles are also a blood donation center. Last time I had fleas (way back in college, when dinosaurs roamed the earth), I bombed the house with foggers and now shuddered at the thought. Then I found a brand with very acceptable ingredients—a natural, botanical insecticide and an insect growth regulator. So we vacuumed, left while the foggers did their job, and aired the place out for a couple of hours before we went back in, pleased that there was no residual smell whatsoever. Well, the fleas didn't seem to mind it much either. So I called Common Sense Pest Control expert Bill Quarles, Director of the Bio Integral Resource Center in Berkeley, California (www.birc.org). "Don't bother bombing the place with foggers," he says right away; "people often tell me they don't work very well" Waaa-waaaa! Wish I had known that Sixty dollars ago! And of course, he also has to add, "and you're probably exposing yourself to SOME kind of residue as well." Ahem. Anyway, then I found something that does work: traps. The results were amazing—once all the other lights in the room were turned off, the fleas could not wait to jump to their doom! After an initial week-long surge, we changed the trap paper and only caught a few more. But I knew there were eggs that would soon hatch, so we left the traps out and a few weeks later a second wave hurled themselves to their doom. We replaced those sheets and so far the new ones are still flea-free. As are our ankles. The design is simple; it's easy to make your own if you like. 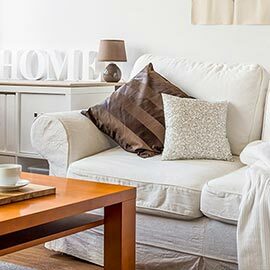 Just suspend a seven to 25 watt bulb overtop of a flea death trap—like a pan of soapy water or a sheet of sticky paper and turn off all other sources of light. The fleas jump right to their doom. insect growth regulator. "IGR"s are a new type of insecticide that isn't a poison. These chemical compounds prevent insects like fleas and termites from successfully molting, so they can't become destructive adults. IGRs don't affect (non-molting) mammals, amphibians or earthworms, and I can't think of any beneficial insects that spend their time in turf. 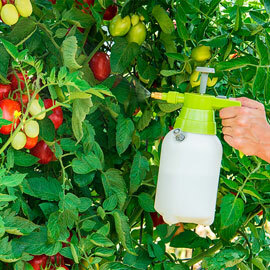 sprayer that has NEVER held chemicals of any kind. The creatures work their way down into the soil where they seek out and destroy grubs and similar nasty things, and as a bonus, any flea eggs and larvae they encounter. And then there's the 'vector'—the pets themselves. You can keep fleas under control most of the time by washing your pets and grooming them frequently with a flea comb, but Bill Quarles warns that some sort of flea killer will eventually be needed, and his research has led him to conclude that the topically-applied product "Advantage" is the best and least toxic. A synthetic form of nicotine, small drops are applied to the animals' fur and disperse over their entire coat, killing fleas within 24 hours. Bill says it doesn't seem to harm the pets, and it's the only such product his chemically sensitive subscribers can use. But if you can't bring yourself to use it or something similar, I completely understand. Try adding some Brewer's yeast and garlic to your pets' food; many people swear it keeps fleas and ticks at bay. And if your pet is ever stressed, injured or ill, keep an especially close eye on them—and on your ankles. Fleas, like most pests, really do seem to be found around the weakest prey.